Well, ladies and gentlemen, we've received reports of another Ferrari fire, this time on the famed Nürburgring in Germany. To be honest, it's kind of a relief. Since I started this gig I feel like I've covered one Ferrari fire (or horrific crash) every weekend, and I was beginning to worry there wouldn't be one this week! This weekend's Ferrari fire comes to us from friend of the site Andy Jaenen of Sky Limit Events. 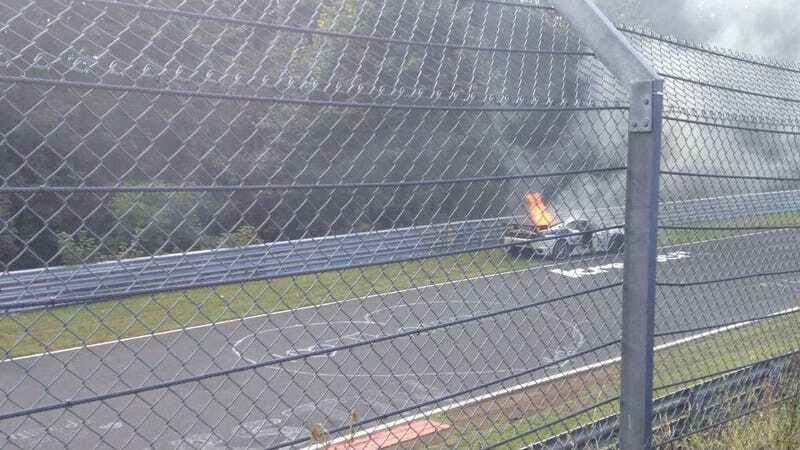 Andy tells me that the fire happened halfway the four hour VLN endurance race at the 'Ring. "The fire rescuers arrived just after this picture and saved the car," Andy says. Thankfully, the driver was out in time, he tells us. Sad news, but as we've seen many times over, fires are just part of the cost of ownership when it comes to Ferraris and other supercars. Thanks for the tip Matt Clark!